If you haven't seen Lemon's newscast (maybe like me, you don't get cable TV), you can see some of his best work on YouTube. The first time I saw him in action, I couldn't believe his intelligence, wit, and cut to the point tactics. I wondered where did this gay chap come from. I never saw his likeness in the segregated South where I grew up. 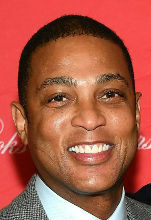 Don Lemon was born, raised, and educated in Louisiana. After several years with NBC, he move to CNN in 2006 where he was working when he came out as gay. You have to marvel that TV has three outstanding gay broadcasting people including Don Lemon, Anderson Cooper, and Rachel Maddow. Now with a gay Presidential Candidate, it looks as if the USA is slowly creeping into the 21st Century. For the article on Lemon's engagement (with photos), Click On. Have you visited all of the places in your bucket list? Traveling and playing the tourist can be a lot of fun. For this week's poll, an fellow Apollo man wants to know whether or not you've been and seen the places in your bucket list. Choose the answer that best describes you. Do you want to see the results for previous polls? If so, Click Here.